Naturally, prior to its announcement, the iPhone 5 was surrounded by hundreds of rumors. Somewhat unexpectedly though, this time round most of them turned out correct and we knew almost all there was to know about the latest Apple flagship, long before Tim Cook took the stage. The amount of leaks of hardware parts and accessories as well as reports of iPhone 5′s features that turned out to be true was staggering. In fact we knew more about the iPhone 5 than we knew about the iPhone 4 and back then a real unit escaped the R&D center. There were still a few persistent rumors that turned out incorrect, so we thought we might do a quick round up and see if we’d actually miss any of them. But first thing first – here’s the list of rumors that turned out correct. First off, the screen. An iPhone with a 4-inch screen was rumored ever since the iPhone 4 went official and we started waiting for the 4S. It didn’t happen last year, but the iPhone 5 finally got the hotly anticipated bump in screen size. The numerous cases and part leaks also confirmed this multiple times so there were few raised eyebrows when Phil Schiller confirmed it on stage. We even knew that the screen resolution will be changed accordingly and the aspect will be changed. Even the fifth row of icons wasn’t a surprise thanks to the iOS 6 emulator. The smaller dock connector appeared a few dozen times, along with the new-two tone design, all of which we witnessed at yesterday’s event. We even got to learn the new connector’s name and price prior to the press conference, which is hardly ever the case with Apple’s products. Aluminum and glass combination. That’s what Apple is using for the new iPhone. It’s cool, but not shocking, and once again we have the leaked parts straight from the factory floors where the new iPhone 5 is made, to blame. 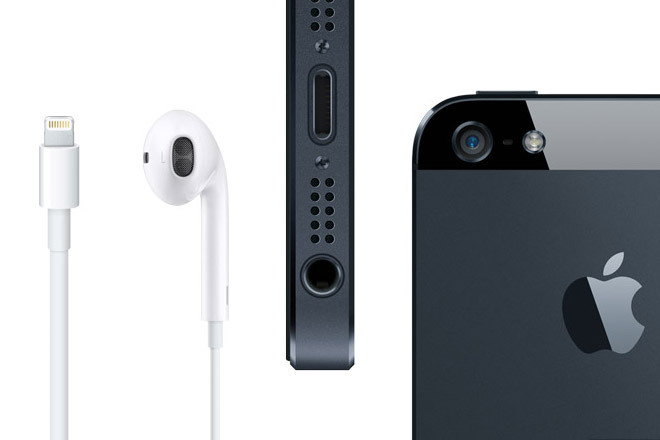 So if the design of the iPhone 5 couldn’t be kept under wraps, what was left for the earbuds that come in its package? Yes, they too shared the destiny of the Lightning dock connector and surfaced well in advance, complete with pricing info and name. Those three didn’t even need leaks, really. Everybody knew that the iPhone 5 is going to run iOS 6, it was just a matter of making it official. The same goes for the nano SIM, which the iPhone 5 uses . Apple fought hard for its version of the nano-SIM standard, so from the moment it was approved, we knew the iPhone 5 would utilize it. Last year, Apple decided to skip on LTE for the iPhone 4S, but leaving it out of the iPhone 5 would be too risky. Not to mention that most of the latest mobile chipsets support native LTE radio – 4G is no longer eating batteries for breakfast. Up until Apple sent out event invites to the press, it was hotly debated whether the next iPhone will use the iPad naming scheme and just be called the ‘new iPhone’ or stick to its roots and add a “5″. As the invite for the event confirmed, Apple chose to stick with the numbered iPhones. Now, let’s review some of the rumors that came out false. Slowly but surely, more and more Android and Windows Phone devices started featuring NFC capabilities, but Apple decided to skip it with the iPhone 5. Mind you, their Passbook feature for storing loyalty and gift cards as well as boarding passes and tickets is as ready as it’s ever going to be, but maybe it just isn’t the right time for Apple. Probably, the guys over at Cupertino are leaving the NFC feature for the iPhone 5S. By then, the technology will be more widely spread and Apple will havemore time to attract more partners and enable NFC-sporting iPhones to do more cool things. T-Mobile continues to be the only major US carrier that isn’t offering the iPhone. Although the company teased that people should be expecting exciting news in the near future, it turned out the news isn’t related to the iPhone 5. Bummer, really. A fingerprint scanning Home button sounds like something taken out of a spy movie, but some rumors suggested it’s a real possibility. No matter the wow-factor it would’ve brought, many people though its highly unlikely for Apple to go this far with security of the iPhone 5. But who knows, maybe the iPhone 5S will allow you to not only look like James Bond, but actually feel like one as well? Apple CEO Tim Cook made an announcement couple of months ago that the company is doubling the security around future products to keep leaks away. The first ever product to go under the umbrella of this promise was the iPhone 5, but ironically almost every part of the new iPhone was leaked. Tim Cook should better work harder on that security or the Apple press conferences might turn from the industry’s most exciting events to snooze fests.